Duane Stjernholm has big ideas for hemp. The plant itself is incredibly versatile in its industrial uses, but getting into hemp farming can be a costly operation. Stjernholm, Co-Founder of CHPC along with his wife, Carly, believes a statewide cooperative can network farmers with business interests. 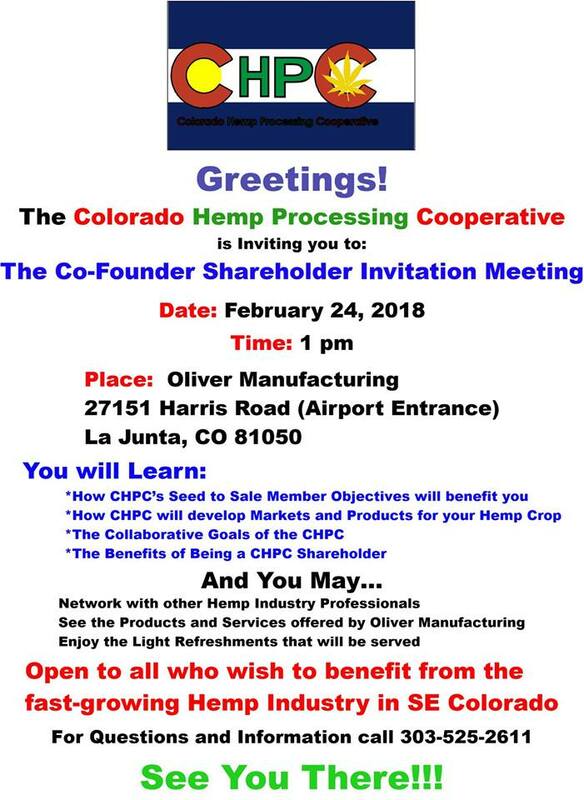 The coop will purchase and lend harvesting and processing equipment to growers. It also seeks to develop the hemp market. This includes textiles, twine, clothing, food and animal feed, and etc. Duane Stjernholm coordinated with Oliver’s Brian Burney, and La Junta Economic Development’s Danelle Berg, Rachel Patrick and Cynthia Nieb, to organize the meeting. We invite anyone interested to attend, and also to share the word! While the cooperative will function statewide, Duane is particularly excited about the potential it offers to the Arkansas Valley and Southeastern Colorado. If you find this subject matter interesting, then it would serve you well to stay tuned! We have a lot of great hemp content that is working its way through the pipeline.